GO AHEAD, TAKE A PEEK....... THE AUGUST ISSUE IS OUT! STROLL ON DOWN AND WISH ELEMENTE' A HAPPY ANNIVERSARY! a. A custom, practice, relationship, or behavioral pattern of importance in the life of a community or society: b. One long associated with a specified place, position, or function. c. Elemente'. 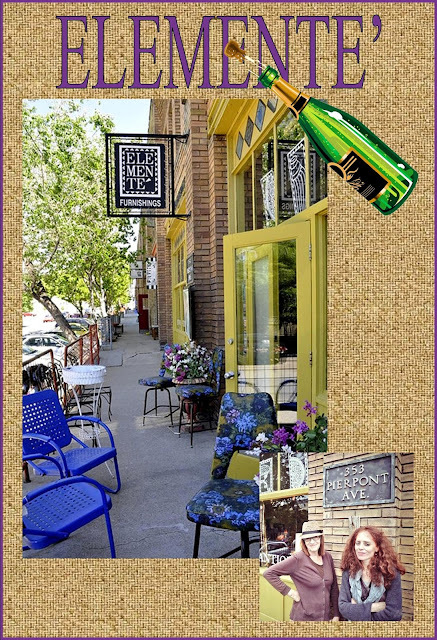 If you like your antiques served with a little common sense, and a side of amity instead of pretention, you're probably part of the crowd that has spent years filling their homes with hand picked furnishings from Elemente', Salt Lake City's hippest vintage/retro/resale shop. For more than two decades, Elemente' has been dishing up the kind of things that were trendy before anyone else knew it. Making my monthly pilgramage down town to see Kate & Teresa turns is something I always look forward to. Happy anniversary ! For those of us who find antiquing to be a religous experience, Sunday morning was nothing less than zen. The Urban Flea market at 6th South and Main Street, and the Salt Lake Vintage Flea market on 1300 So. and 5th West both held the kind of services that make you want to set your alarm clock. You couldn't ask for a more fabulous morning to wander around the shady Urban Flea Market in downtown Salt Lake City. Booth after booth offered a nice selection of antiques, and vintage merchandise. The sun was warm, the vendors friendly, and prices enticing. The farmers Market component added to this years Urban Flea market was offering a selection of early Utah crops, crafts and specialty foods. By the time we got to the Salt Lake Vintge Flea Market, we found ourselves saying a little prayer for whoever invented air conditioning. It seems like you could melt just walking from the parking lot to the front door, but step inside, and you'll find they keep this chapel nice & cool. Flea Market owners Will Dator & Emy Maloutas can usually be found at the front desk welcoming their parishioners. Housed in an old warehouse, the place is stuffed with just the kind of goodies that vintage & retro shoppers are looking for. Antiques & collectibles, vintage clothing, records, jewelry, knick knacks & whatzits abound at the SL Vintage Flea Market. Nice & cool in the summer, and toasty warm in the winter. You just won't find a better place to go to Sunday School. 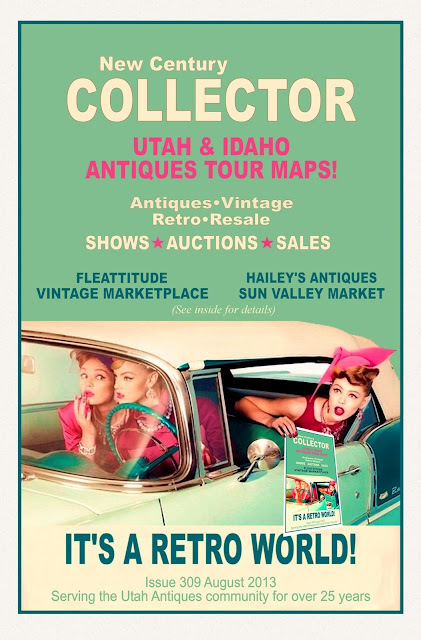 The Salt Lake Vintage Flea Market is open year round, Saturday & Sunday from 10:00 to 4:00. 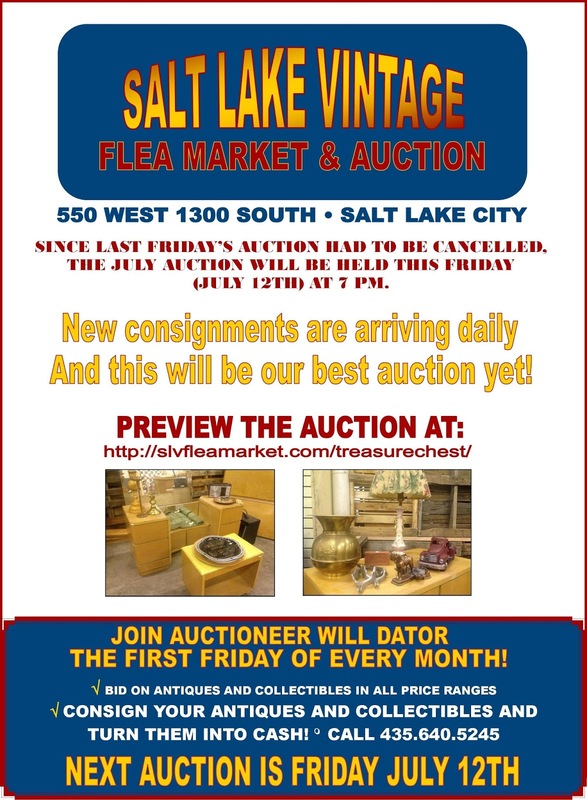 SINCE THE AUCITON AT THE SALT LAKE VINTAGE FLEAMARKET WAS CANCELLED LAST FRIDAY; WILL, EMY & THE CREW WILL BE BRINGING DOWN THE GAVEL THIS COMING FRIDAY ON WHAT SHOULD BE THEIR BEST LOT OF CONSIGNMENTS TO DATE. THIS AUCTION IS A GREAT WAY TO SPEND A FRIDAY EVENING. PEOPLE WATCH, EAT LITTLE AND IF YOUR THE BRAVEST BIDDER, TAKE HOME A TREASURE OR TWO! SEE YOU THERE. Although most collectors share the same love and intrigue of old things, we all seem to approach collecting with different motivations and goals. For someone it might be an old piece of pottery, just the right color to accent the kitchen, for another, an example to fill in a hole in a burgeoning collection. Some are intrigued by historical context, and still others collect with an eye toward investment. Having been at it for 25 years, I have accumulated objects that fit into each of these categories. And I long ago, learned that there is no "right" way, or reason to collect. Each collector finds his own way. As the years have past, our house seems to have become engorged with things we thought we just had to have. Shelves and cupboards house collections of things that caught our fancy at one time or another, becoming roommates of objects strewn throughout the house for decorative purposes. But, on a couple of shelves, in one small cabinet, lives a small menagerie of things that distinguish themselves from the others, and which for me, characterize the most essential part of collecting. You might call them our "memories shelves". Residing there are Lyn's grandmothers watch, my fathers baby bowl; the sole survivor of a fire that took the family home in 1930. A cherished chalkware cow, which was a favorite childhood plaything, left to me by my grandmother, another grandmothers beaded bag, a collection of miniature hat boxes gifted to my ever bald grandfather by his haberdashers, and a 1950's rocket ship bank which ate coins as we amused ourselves around the kitchen table. The house is full of things that we've acquired, but these are the shelves that contain the things we value.Much like old photographs, journals and other documents, personal possessions left behind can help preserve our family memories. I never saw my grandfather outside of his home, that he was not sporting a stylish chapeau. Nothing could remind me more of him than the little collection of miniature hat boxes which I found in his bedroom dresser after his death. And don't forget, memories come in big packages as well. That dresser, along with it's matching dressing table, now reside in my bedroom, keeping my grandparents a constant presence in our lives. And if you're lucky, your affinity for old family objects will become trans-generational. My grandson Alec keeps me constantly aware of my promise to pass along that rocket ship bank. He'll share a few memories too, we still take it out of the cabinet once in a while, and amuse ourselves as we sit around the kitchen table and feed it coins.